(Corpus Christi, TX May 7, 2018) – Comedy legends Steve Martin and Martin Short will perform a one-night-only show, An Evening You Will Forget for The Rest Of Your Life, at American Bank Center Selena Auditorium on Sunday, October 7, at 7:00 PM. Tickets will go on sale Friday, May 11, at the American Bank Center box office and Ticketmaster.com or call 800-345-7000. Ticket prices range from $99 to $199, plus service charges and fees. Martin and Short will be joined on stage by the Grammy Award-winning bluegrass band The Steep Canyon Rangers and renowned jazz pianist and Jimmy Kimmel Live band member Jeff Babko. Steve Martin is one of the most acclaimed and beloved talents in entertainment. His work has earned numerous honors including an Academy Award, five Grammy Awards, an Emmy Award, the Mark Twain Award, and the Kennedy Center Honors. Many of Martin’s films are considered modern classics including: The Jerk, Planes, Trains & Automobiles, Roxanne, Parenthood, L.A. Story, and Father of the Bride. As an author, Martin’s work includes the novel An Object of Beauty; the play Picasso at the Lapin Agile; a collection of comic pieces, Pure Drivel; a best-selling novella, Shopgirl; and his memoir Born Standing Up. His latest play, Meteor Shower, just concluded its Broadway run in a production starring Amy Schumer, Keegan-Michael Key, Laura Benanti; and Jeremy Shamos, and directed by Jerry Zaks. Steve Martin is also an accomplished Grammy Award-winning, boundary-pushing bluegrass banjoist and composer. In 2013, Martin released his third full-length album called Love Has Come For You, a unique collaboration with songwriter Edie Brickell. Love Has Come For You won a Grammy for Best American Roots Song for the title track and inspired the Broadway musical Bright Star, which received five Tony Award nominations and also received Outstanding New Broadway Musical and Outstanding New Score at the Outer Critics Circle Awards. Martin and Brickell’s second album together, So Familiar, was released on Rounder Records and featured 12 remarkable songs that bought the acclaimed duo’s musical collaboration into fresh creative territory. Steve Martin and The Steep Canyon Rangers recently released their newest collaboration The Long-Awaited Album on Rounder Records. 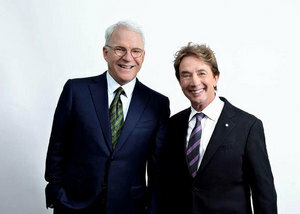 Follow Steve on Twitter @SteveMartinToGo. Martin Short is a beloved comedian and actor, whose career spans television, film and theater. Since his breakout performances on NBC’s Saturday Night Live, Short has become a household name with roles in feature films including the science fiction comedy Innerspace, Three Amigos, and as the quirky wedding planner, Franck Eggelhoffer, in the Father of the Bride series. He has also delighted audiences in Broadway performances including his 2006 revue Martin Short: Fame Becomes Me and the 1998 revival of Neil Simon’s Little Me. Short has earned two Emmy Awards for his writing in SCTV Network 90, as well as his involvement in the 2014 AFI Life Achievement Award: A Tribute to Mel Brooks. He is also recognized for his performances in several television series, including Damages, Primetime Glick, Merlin and SCTV Network 90. Short also starred opposite Maya Rudolph in NBC’s comedy show Maya & Marty. SMG managed American Bank Center is Corpus Christi’s premier event center. Follow us online at www.Americanbankcenter.com, facebook.com/AmericanBankCenter, twitter.com/AmericanBankCtr, on Instagram @americanbankcenter, Tumblr @AmericanBankCenter, and now on Snapchat @Americanbnkctr.